GameStop: Wii U sales disappointing but PS4 purchase intent "strong"
GameStop reported its earnings for the holiday quarter, and the results were mixed - which investors interpreted as good in a year when retail game sales were down by double digits overall. On the earnings call, CEO J. Paul Raines tried to put the news in the best light possible, of course. Raines had to admit, though, that last year was tough, citing a 21 drop in software sales and a 25 percent decline for hardware from NPD numbers. Of course, Raines was careful to point out that GameStop outperformed against that backdrop. Investors apparently liked what they heard, because GameStop shares were up over 7 percent after the earnings call. Raines noted that GameStop has over 30 percent software market share in most of the markets, and the company grew its margins by 400 basis points. Outside of the classic physical business, Kongregate grew 48 percent during 2012, and GameStop's mobile division reported $184 million in sales. "We are going to be a strong player in launches of new tablets and devices," Raines claimed. "We expect the first half of the year to be very difficult as we wait for new consoles"
CFO Rob Lloyd added some detail to the numbers, noting comparable sales for the last quarter were down 4.6 percent when you took into account that the quarter had an extra week. The Wii U launch helped keep the quarter from looking even worse. Overall, the picture for the year wasn't great: A 7 percent sales decline for the year, and business in comparable stores was down 8.7 percent in US. GameStop was able to increase its earnings per share by 10.5 percent despite the grim retail sales picture. The essential question for GameStop's future is this: Will new consoles offset the decline in current generation console sales? The guidance given for 2013 wasn't rosy. "We expect the first half of the year to be very difficult as we wait for new consoles," Lloyd said. "We expect to return for growth in the back half of the year." Putting numbers on that, Lloyd said that the full year would be down 8 percent to flat, with full year net income declining from 7 to 18 percent. According to Lloyd, the guidance at the high end reflects the possibility of a second new console launch in the fourth quarter other than Sony's PS4. Paging Microsoft; situation desperate, send new console. GameStop continues to profess "great confidence" in new consoles because of prior console launches. While history is certainly of value in predicting the future, it's not a sure thing by any means. The marketplace is very different than the last time a new console launched. GameStop looks to hedge its bets by continuing to press forward on digital and mobile businesses. However, GameStop's digital business is $600 million, mobile business is $186 million... and those combined are still less than 10 percent of overall GameStop sales. Growth rate in digital and mobile continues, but it will not compensate for the decline in retail. GameStop is assuming that sales of used software - a "significant contributor" to its profit - will improve this year, but that remains to be seen. As far as specifics for the PS4, president Tony Bartel noted there is "strong purchase intent for PS4" with nearly 900,000 consumers signed up for early information about the PS4. "We do believe demand will far outpace supply within the launch window, although we have been given no official numbers by Sony," Bartel added. 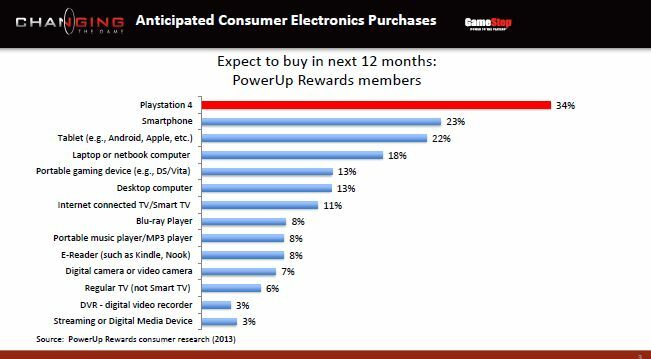 GameStop's consumer research shows that some 34 percent of people queried expect to buy a PS4 in the coming year, higher than interest in any other hardware. GameStop's EVP of strategic business, Mike Hogan, referenced an elaborate model GameStop has put together to forecast sales over the next few years. 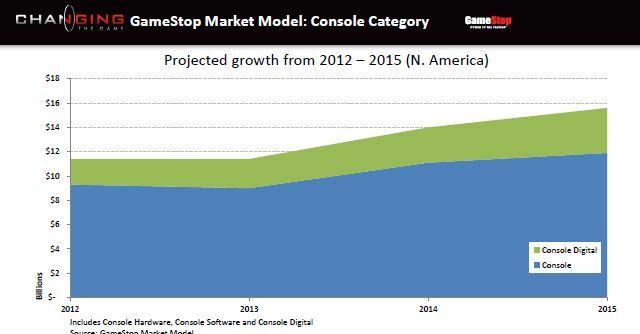 According to the GameStop Market Model, new consoles will have a slight positive impact on the market in 2013 with an increase in the console market of up to 20 percent through 2015. What he failed to mention is that when considered in the context of years of decline, this will not return the industry to the heyday of 2008, nor anywhere close. GameStop's consumer research also showed that 60 percent of customers would be significantly less likely to buy a console that blocks used games. "It's clear that consumers have a very strong point of view; that's not a debate, that's obvious," said Raines, sending a message to manufacturers who might have contemplated adding that feature. Even if consoles don't generate profit directly, it's necessary to sell a lot of them to sell profitable software. Used software may be a necessary evil that manufacturers and publishers will have to put up with, if you believe GameStop's numbers. One analyst queried GameStop about the Wii U's prospects, saying that the Wii U has been fairly disappointing. "The Wii U actually exceeded our expectations at launch," said Bartel. "We were actually out of stock early on in the launch period. However, it has been disappointing since the beginning of the year." Bartel noted two reasons for that. First, he feels consumers don't understand the tethered tablet and the way the gameplay works. "The marketing has not broken through at the level that it needs to," Bartel said. "I think we still have an education process that we need to go through." "The Wii U actually exceeded our expectations at launch... However, it has been disappointing since the beginning of the year"
Bartel pointed to the software as the most important reason why the Wii U hasn't caught on. "More importantly, I think where you're really going to see Wii U take off is when there is a strong first-party title," Bartel said. "That's what we've always seen, and the fact that we launched without a strong first-party title, I think we're seeing the ramifications of that today. Those are two things we do expect to be remedied later on in this year. There's no doubt the launch was strong for us, but it has been disappointing since the first of the year." Raines added, "I think there's lots of opportunity for that platform still." Parsing those statements, GameStop knows Wii U sales have not been great lately, but is hopeful Nintendo can step up with with some marketing and a hit title or two to fix things. Marketing isn't really going to be enough, though, if the games aren't there. Anyone who was interested in buying the Wii U because of its future potential probably already has one. For the rest of the market, purchases won't happen until there's a game on the Wii U that people absolutely have to have - and that they can't get anywhere else. Pikmin 3 probably won't be enough; one or more of Nintendo's other iconic franchises are going to have to ride to the rescue. GameStop looks like it's going to try everything it can to improve sales, but ultimately it's not expecting new consoles to really overcome the negative factors this year. The company is hoping that 2014 and 2015 will be better as new consoles start selling strongly - if, indeed, they do. "These are exciting times for us here at GameStop," Raines said at the conclusion of the earnings call. Perhaps too exciting, or maybe not exciting enough, depending on how you look at it. Either way, it's going to be difficult. I think most places in the US feel that Wii U and Vita sales are disappointing at this point. But I wouldn't write the Wii U off just yet. They still have a big holiday season to get thru and hopefully some new game announcments for E3. E3 will be big for the Wii U. It's important to know what's coming out this year and if that will be able to arrest some of the attention being paid to the PS4 and whatever the next Xbox will be called. But how committed is that intent toward buying the machine? SONY hasn't even shown us what it looks like but you already heard them barking and they promised you it has a waggly tail. We may all gawk at the goodness (not really) of PS4 visuals but at the end of the day it all comes down to you asking, how much is that doggie in the window? David let`s hope so, my Wii U is collecting dust because of the low amount of actually new games versus games that get released for it that I finished already a year ago. Sure it`s nice for people who had only a Wii to get games Darksiders 2, but I kind of suspect people who wanted to play Darksiders 2 don`t only have a Wii and playerd the game already on another platform. Andy I assume people go right now by the price analysts throw around. The more important part is software, as we have seen with the Vita, 3DS and Wii U. If you don`t have the games it`s hard to get people to buy your hardware no matter whats the price of it and how good the hardware is. The Sony core fanbase will be big enough for them to shift a good amount of consoles especially here in Europe and of course in Japan. I`m going to get one for sure on launch. I intend to buy a PS4, just waiting for the announcement of the price to confirm. However Im sold on the features and specs. I find it to be an ideal platform for great games.